Comment: 10 X 50 patio area against existing building with 12" footers on outside patio area not along wall. Comment: I live in the low country. I would like a drainage system put and approx. 200 ft of driveway paved. Comment: want labor only to lay and pack structural base material (crushed concrete), and lay flagstone, fill point. Already have flagstone and structural base material. 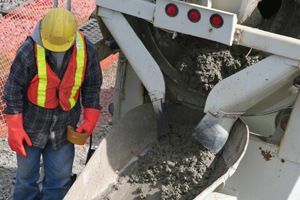 Approximately 270 square ft.
Austin Tiger Construction Co., Inc.
Georgetown Concrete Contractors are rated 4.66 out of 5 based on 157 reviews of 14 pros. Not Looking for Concrete Contractors in Georgetown, SC?